Helping your kids celebrate the wonders of our planet doesn’t mean you have to make sweeping changes to your lifestyle. Often the lessons with the biggest impact are small! Unplug the whole family and have a picnic dinner at a local park, or even in the back yard. Create a neighborhood smartphone scavenger hunt - pair little kids with bigger kids to take pictures of Mother Nature’s small miracles like budding leaves, colorful flowers, squirrels, birds’ nests, beetles and butterflies. Plant a vegetable garden or a tree together, or plant flowers in pots for the windowsill! As a family outing, participate in a park clean-up effort, or if none exists, plan your own neighborhood-wide event using SignUp.com. Create a free SignUp sheet listing cleanup locations, supplies and tools needed (think trash bags, lawnmowers, edgers, hedge clippers, seasonal flowers) and refreshments. On the big day, work alongside your kids to pick up trash and spruce up landscaping. SignUp.com will even send thank you notes to everyone who participated! 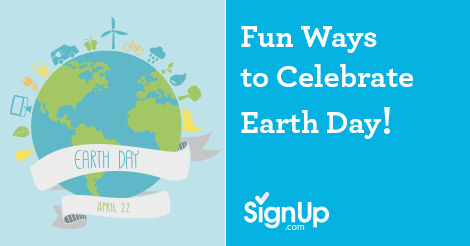 Make a pledge to do one earth-sustaining thing every week. Walk or ride bikes to school or work (or if that’s not feasible, organize a carpool.) Plan one day a week of meatless meals. Give up bottled water for one day, or pack lunches in reusable containers instead of buying food in disposables. Commit to recycling as a family. Get creative! Decorate canvas shopping bags with paint or permanent markers and store them in the car for shopping trips. Create ‘found art’ sculptures out of packing styrofoam, plastic bottles and other discarded items. Make simple bird feeders by rolling toilet paper tubes in peanut butter and birdseed, hang with string. A simple activity with an enormous payoff is to raise and release butterflies! Either purchase a butterfly kit or take your kids on a butterfly egg hunt. Create a home for them with a good amount of space and ventilation. Research the appropriate food for the caterpillars to eat and provide something for the caterpillars to climb up to create their cocoons. Watching the life cycle in action is something your kids will never forget. Are there programs promoted by your local government that offer recycling incentives or program support? What is the life cycle of paper, water bottles and electronics used on campus? Are there overlooked opportunities to reduce waste? Would it be feasible to plant a school garden? What happens to cafeteria leftovers? Can you partner with local shelters to pick up excess food? Are there ways to turn recycling efforts into cash? Several fundraising companies support recycling of specific items like batteries and kids’ clothing collected from the broad school-family community. Looking for more great Spring Activities & Events? Check out our Spring Idea Center here.